-Take Exit 2 towards Rt 3A Hudson, NH. -Get in the left most lane, Sam’s Club will be on your right. -At the set of lights you will turn left (north) onto Route 3A which is also Lowell Road. -Stay in the left lane. 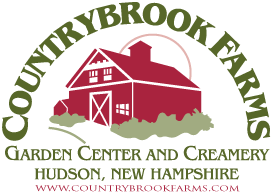 -Countrybrook Farms Garden Center is less than a mile on your left. -We’re directly across the street from The Presentation of Mary Academy, and immediately after Tire Warehouse. You can’t miss our Big Red Barn! -Take exit 3 to Route 111 in Windham, NH. -Take your left at the stoplight onto Route 111 going west. -Go approximately 10 miles to it’s end at the light at Route 3A intersection. -Go left onto Route 3A going south. -We are approximately 2 miles on your right, directly across the street from The Presentation of Mary Academy, and just before the Tire Warehouse. You can’t miss our Big Red Barn! -Take the East Hollis Street Bridge over into Hudson. -Immediately after crossing the bridge, take a right onto Route 3A going south. -We are approximately 3 miles up on the right side and directly across the street from The Presentation of Mary Academy, and just before Tire Warehouse. You can’t miss our Big Red Barn!